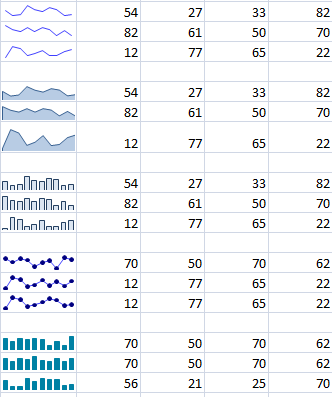 TinyGraphs is an open source add-in for Excel that creates sparklines, mini column graphs, and area graphs from a row of data. It generates beautiful tiny graphics that are as small as a cell and is useful for visualizing large quantities of data, such as stock prices and exchange rates. What does TinyGraphs do ? TinyGraphs creates a tiny chart for every row of data in a rectangular block of cells (user specified range). Using the TinyGraphs plugin is very simple. Click the Create Tiny Graphs button to bring up the main dialog, then select a range of data, a column to place the sparklines and graphs, and a chart type. Click the OK button in the main dialog to generate the graphs. 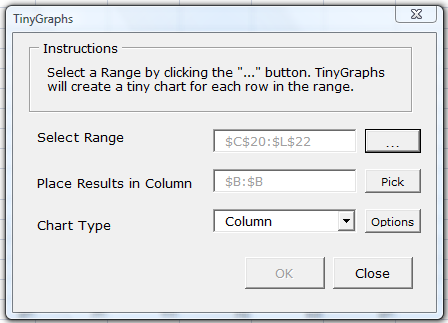 After a successful installation, the TinyGraphs toolbar will be available in Excel 2003. For Excel 2007, the toolbar is found in the Add-Ins Tab. TinyGraphs is written as Excel VBA Macros and the source code can be viewed in the Excel Visual Basic Editor. Download TinyGraphs.xls to customize the source code now. Thanks to Gerard from Netherlands for fixing the bug that makes Tinygraphs work in Excel 2003.